Antron Brown in Top Fuel and Erica Enders in Pro Stock started the 2015 coronation of champions at the Toyota NHRA Nationals, both claiming their second NHRA world titles on Sunday on The Strip at Las Vegas Motor Speedway. 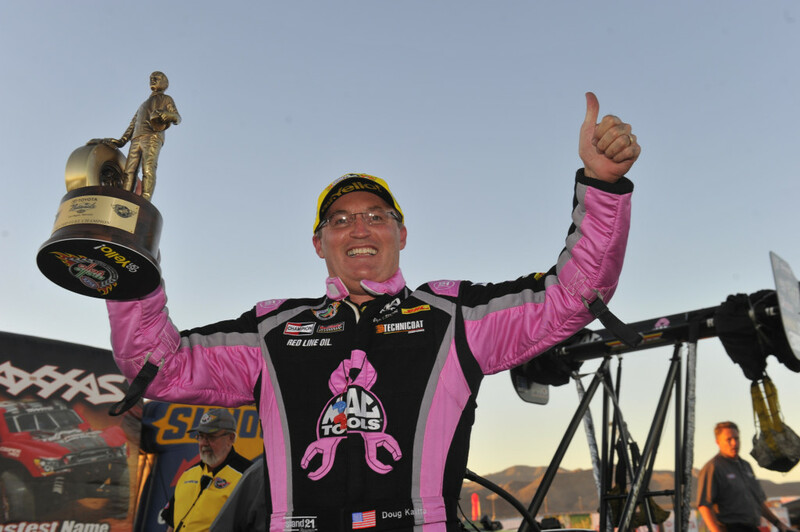 At the end of the day, it was Doug Kalitta winning his third race of the year against Larry Dixon in the Top Fuel finals. 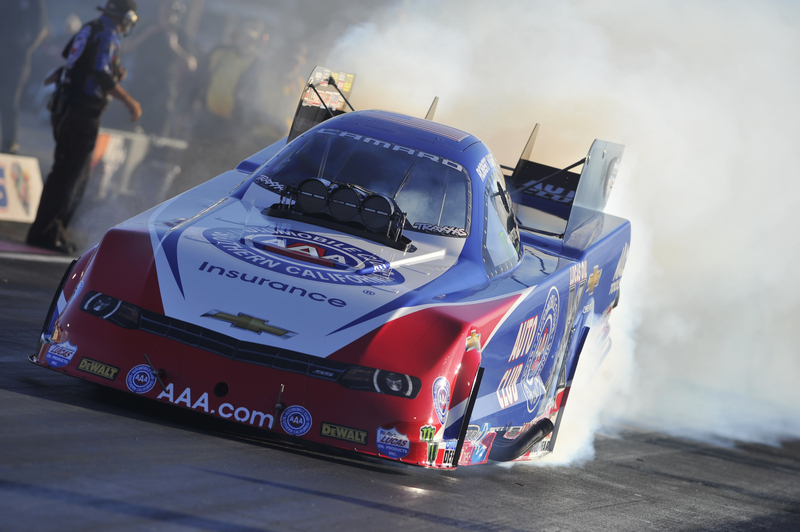 Robert Hight won over a super-quick Funny Car field, taking down a tire smoking Tommy Johnson, Jr. in his money round. Now a two-time Pro Stock champion, Enders defeated Bo Butner to continue her Las Vegas winning streak and Andrew Hines won over a red lighting, Jerry Savoie in the Pro Stock Motorcycles. For Top Fuel driver Doug Kalitta, his crew chief, Jim Oberhofer didn’t like the way his dragster was responding to changes and on Friday night decided to switch cars, going to a backup chassis proving instantly more consistent in Saturday’s qualifying, and the change put them on the path to victory. It was Kalitta’s third win of the season, his 38th of his career, beginning his race day defeating Steve Torrence first round, Richie Crampton in the quarterfinals, and repelled champ, Antron Brown in the semi-finals by .0005 of a second or a half inch margin of victory after Kalitta laid down a time of 3.774 seconds, 322.73 mph. It was his first third round appearance since Norwalk back in July. 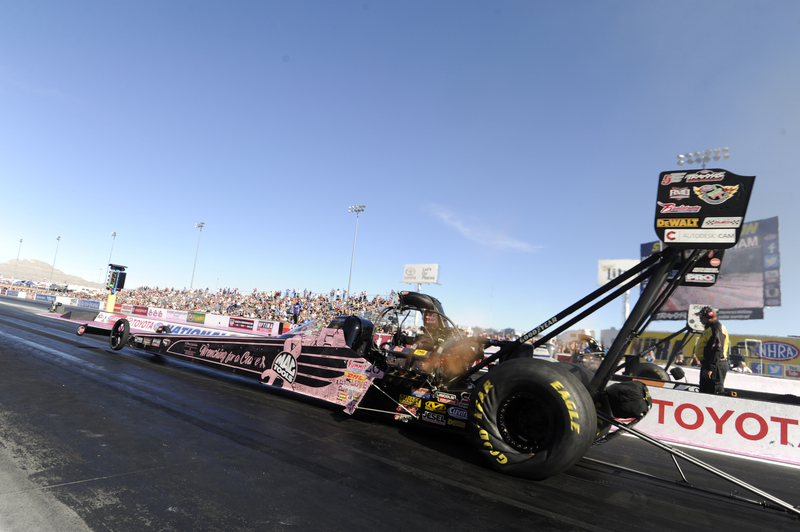 As the finals approached, Larry Dixon smoked the tires, almost immediately propelling Kalitta down the track. Near the finish line, Kalitta’s car started dropping cylinders, blowing the injector sideways, but reaching the line first over Dixon for the win running a time of 4.239 seconds to Dixon’s 8.100. Kalitta advanced in the standings less than one round from the top five. Tony Schumacher is second while runner up, Dixon is now third. With only 56 points separating third to sixth right now with Richie Crampton in fourth, and Brittany Force in fifth, this is the where the battle remains in Top Fuel. For the champion, Brown, it’s his second Top Fuel Mello Yello championship and was humbled by closing it out in Las Vegas with one race to go. While all eyes were on title contenders, Del Worsham and Jack Beckman, it would be Robert Hight stealing some of their thunder, winning the Funny Car portion of the Toyota Nationals over Tommy Johnson, Jr.
Hight marched through eliminations beating drivers, Gary Densham, points leader, Del Worsham, and Ron Capps before meeting Tommy Johnson, Jr. in the finals. Hight earned his second win of the season and 36th of his career, powering his Funny Car Chevy Camaro past top qualifier Tommy Johnson Jr.’s Dodge. Hight ran a time of 3.955 seconds at a speed of 323.97 mph after Johnson lost traction. 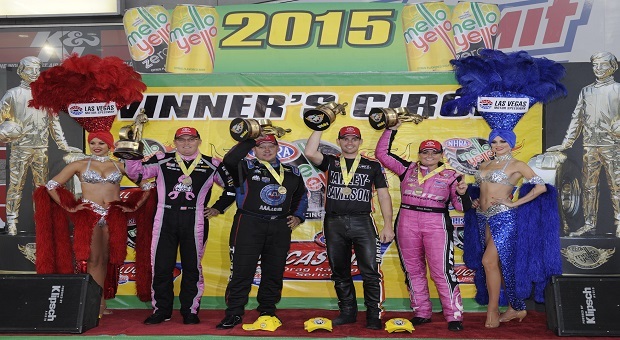 With the win, Hight moved past Don “The Snake” Prudhomme and Cruz Pedregon on NHRA’s all-time Funny Car wins list. 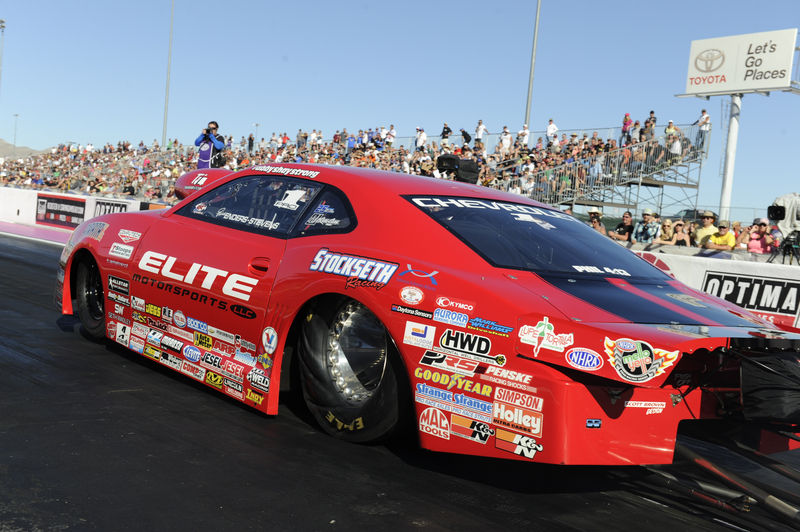 He moved from eighth to sixth in Funny Car points. The NHRA Mello Yello Funny Car title is still up in the air with leader, Del Worsham holding a 38-point lead over Jack Beckman with now the showdown going to Pomona to decide just who will win Fuel Coupe class once and for all. 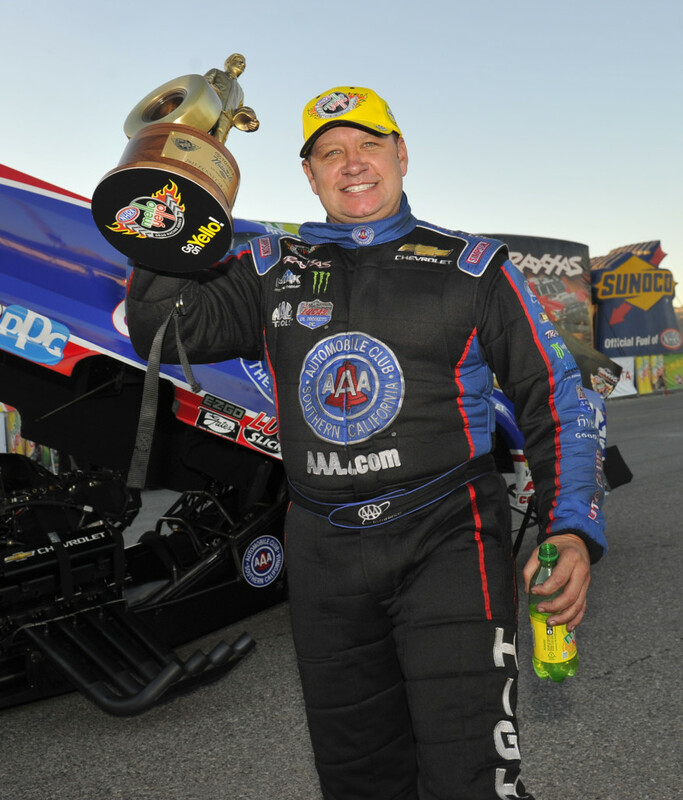 Beckman won in 2012 by two points over Ron Capps, so going into Pomona with just two rounds behind is in a situation that he is familiar with knowing what it’s going to take to make a comeback. “If there’s any silver lining it’s that Del lost that round,” said Beckman. “We’re still two rounds out. It’s real simple. We need to out qualify him at Pomona, we need him on the same side of the ladder as us, and we need to beat him early. 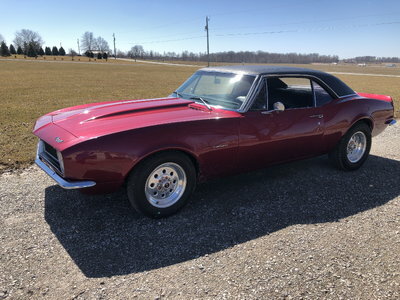 Elite Motorsports driver Erica Enders seems to be able to do anything she wants behind the wheel of a Pro Stock race car. Enders is the first to win consecutive Pro Stock titles since the legendary Jeg Coughlin Jr. accomplished the feat in 2007- 08. Therefore, when Enders knocked out Shane Gray with a round-low pass of 6.596 seconds at 209.39 mph, Enders had the championship locked up. 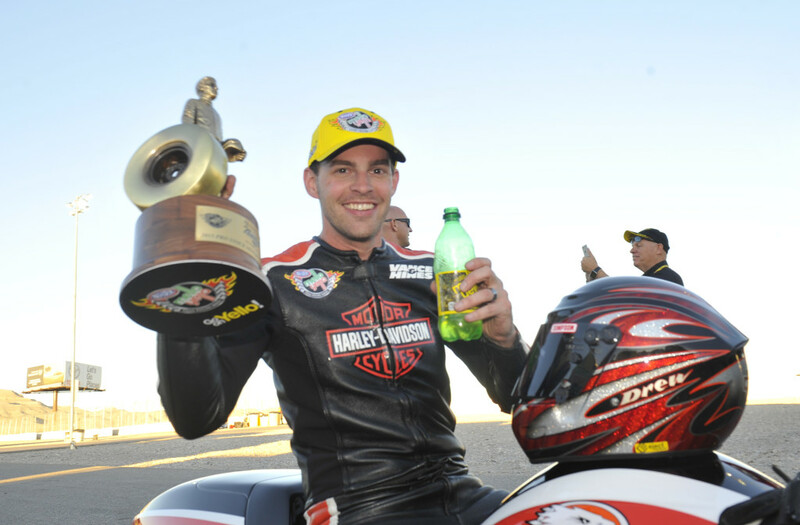 Andrew Hines earned his fourth Pro Stock Motorcycle victory of the season and third in the Countdown, powering his Vance & Hines Harley-Davidson past Jerry Savoie’s Suzuki in a final round with major title implications. With the win, Hines increased his series lead to 46 over the hard-charging Savoie. 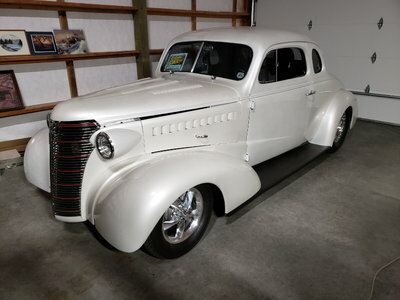 The championship in the two-wheel class will be decided at the Auto Club NHRA Finals in two weeks. 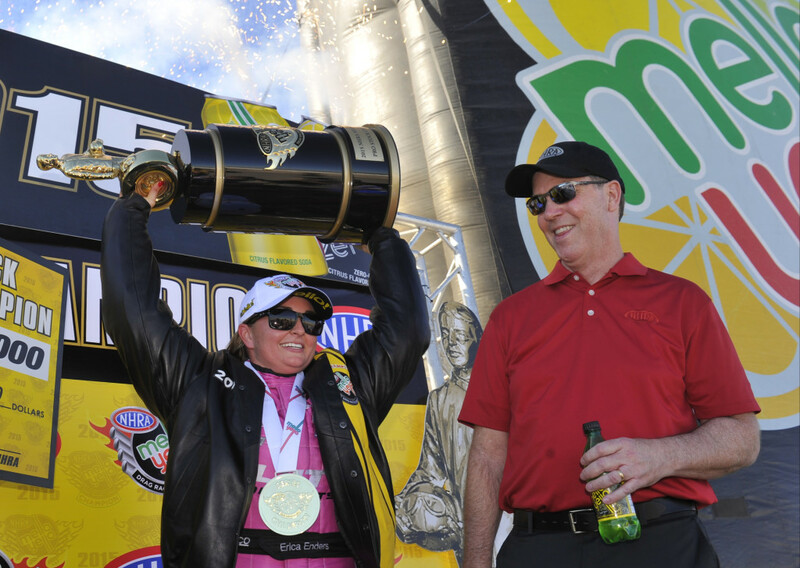 The 2015 NHRA Mello Yello Countdown to the Championship concludes Nov. 12-15 with the Auto Club NHRA Finals at Auto Club Raceway at Pomona (Calif.).